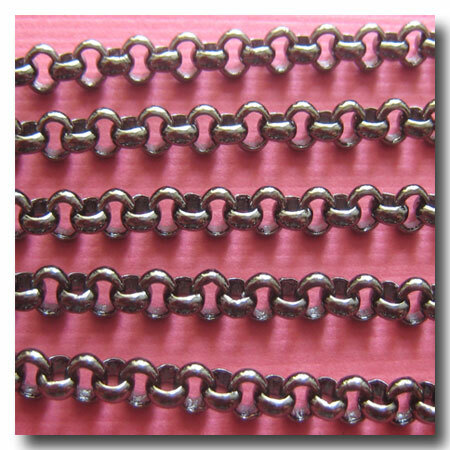 GUNMETAL CLASSIC ROLO (BELCHER) STYLE CHAIN. FINISH: Gunmetal. BASE: Brass base. STYLE: Classic rolo (belcher) design. WEIGHT: Medium. DIMENSIONS: 3mm. Also AVAILABLE in: Gold Plate 1-171, Matte Gold Plate 1-131, Antique Gold Plate 1-114, Rose Gold 1-307, Silver Plate 1-170, Brushed Silver Plate 1-304, Antique Brass 1-099 and Antique Copper 1-092.